Applied with a FICO score of 775, approved for a $10.1k limit. Card arrived within a week, but I had some issues getting it activated on chase pay. Some departments of chase’s customer service are perfectly fine, but other departments seem incompetent with little attention to detail. Like others, I called customer service to request a lower APR % - the first rep said it was impossible. I asked to speak with a supervisor and she said it was impossible. Both could absolutely care less... I had been with the credit card for 3 years and never missed a payment. They didn't even offer to increase my limit over the 3 years so while I was approved for $1,500 it had stayed at that limit the entire time. I was disappointed and in disbelief for their careless attitude so I paid off the remaining balance and closed the account. The 5% is very slowly to accumlate as they have to be in certain categories and to redeem them for anything you'd need many more points than you've earned. I do not recommend this credit card to anyone who already has a score higher than 680 - it'd be better to go with another company altogether. go for it I got approved back in December with $1000 cl and 598 credit score. I just got approved for chase freedom unlimited cl $2000 my score is now 620. Loving so far! Great perks! Abs love so far! Approved as a first time cust with a $3400 CL. My CS increased by 14 pts & I’ve had the card for s little over a month now! What was your credit score when you applied? Beware!! The amount listed as your statement balance on their website is not really your statement balance. They do this so that they can unethically bill you for an interest charge. When you call, they do not listen to what you are saying at all! They just keep repeated how to avoid interest charges, as if you are a child! Terrible customer service and very unethical. They have just lost a very long time customer! Taking drugs cause hallucinations, even credit card hallucinations. They do no such thing. My balance is correct and they listen when I call. I have the card, but I don't do drugs. I just applied for this card and was instantly approved for $5700 cl. CK had me as Fair odds, I thought that I should look at my offers in the Chase app and had pre approval for this one, the Slate and the freedom unlimited. I decided on this one because of the $150 sign up bonus. 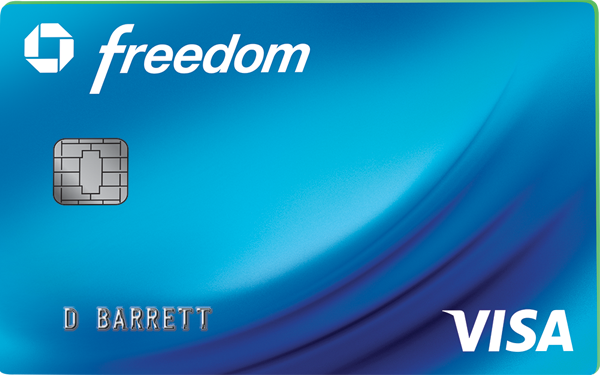 I also have the Saphire Preferred card which I love. I now can combine the points and transfer the points I get Frome the Freedom card to the Sapphire account and get a 25% bonus that way. If you have this card or any other card make sure you pay it off every month and you can make money. I treat all my cards as such and never pay any interest at all. This is how I got this card. I have a Saphire Preferred and was pre approved for this and a couple other cards. If you have a pre approval I would go for it. You should have no problem. Probably more than just maxing out the card caused the account closure. Other accounts might have had negative info. Got this card with an initial 19,100 credit line and ran it up to 18,900. They did not close my account nor try to drop my credit line. I paid it in full once the intro APR was close to expiration. My other accounts were in excellent standing. The card was great. Never had any issues. Chase was always helpful and addressed any issues I had. Chase never bothers you with anything and I could not be happier. They give people a chance when their credit has some dings on it. The card helped me rebuild and I will say it is worth its weight in gold. I applied for this card so I could get an Amazon gift card and the application was approved very quickly but when I tried to validate the card after receiving it I couldn't get the information accepted. I called customer service and was on hold for 25 minutes only to be told that they were having a problem with my card so somebody would get back to me. 4 days have gone by and still no contact from anyone in customer service nor can I validatethe card. I will be canceling this card as soon as someone figures out how I can pay them for the purchase I made. I will go back to only using my Discover card because their customer service is awesome! I have the Chase Unlimited 15K & I just got the Freedom 20 K ,Sugar Babies are taking better care of poppy now !! Take them shopping once a week !! WEEEE HEEEE !! if want another super baby message me! I want to be a sugar baby! !